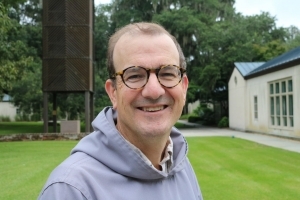 Aim higher: I came to Mepkin with three objectives: improve my prayer practice; experience a full immersion into the daily life of a monk; and begin a discernment about the next phase of my life. I made so much progress on those three goals during my month at Mepkin that I wonder whether I should have included another three, or ten. Waves of grace: I felt immense gratitude nearly every day, and nearly every hour of every day, during my stay at Mepkin. I felt privileged to reside in such a beautiful place, to live in silence, and to brush against the gentle disposition, intelligence and wisdom of the monks. Every sunrise and sunset, a reminder of God’s presence. The horn of a freight train carrying across the river, a temporary reminder of the noise and distractions of the outside world. Each passing nod by a fellow resident, a further embrace into the community. I cannot remember being so content for such an extended period of time. Did I miss my calling? The proverbial bed of roses: But, three weeks into my stay, I hit the monastic wall. I suddenly appreciated that the daily life of a monk is very difficult indeed, and began counting the days until my departure. Fr. Jonas was unsurprised, and confided that the Monastic Guest Program lasts for one month for a good reason: a would-be monk should understand that the life can be monotonous. I was able to muddle through my dry season, as I assume that all monks must do for various stretches of time, and the last week of may stay was replete with blessings. But now I know. The lint screen is always clean: When I did my laundry during college, I always needed to clear the lint screen in the dryer before loading my wet clothes. Ditto for every laundromat that I’ve visited over the years. But at Mepkin, the monk who used the dryer before me had always cleaned the lint screen. For me, it’s a symbol for all of the small kindnesses which come naturally to those who inhabit the place. The liturgy is joy: My wife Dina has commented that Catholicism is a different religion when you go to Mass by yourself (i.e., without your spouse or one or more of our six children). You listen more closely, digest more, and sometimes tap into deeper emotions and insights. And in that vein, I hope that none of the monks noticed that I nearly broke into tears during half-dozen Masses during my month at Mepkin. But if anyone did notice, that’s okay too. And ye shall receive: Stan told me that, unfortunately, he didn’t think that there was a spare copy of the Liturgy of the Hours binder that I could bring home with me after my monastic stay. Yet by the following morning, Fr. Stan had located and presented me with a well-used copy. I couldn’t have been more pleased. I don’t know how you can sing the Magnificat, the Benedictus and the Regina Coeli for a month, and then just stop. And ye shall receive, Part II: I’ve made 18 retreats at other monasteries, and in all cases, chanting with the monks was verboten. So, it was with fingers crossed that I asked Fr. Jonas whether I could sing once – just once – with the Schola during my month as a Monastic Guest. That request immediately transubstantiated into my joining the Schola for the balance of my stay. The privilege of singing with the Mepkin Schola far exceeded anything that I could have wished for during my monastic stay. New frontiers in the Bible: Because I’m Catholic, I don’t know much about what’s in the Bible. So, of course I was discomfited when I had to read aloud at Mass the passage from Ezekiel in which the prophet compares Jerusalem to . . . well, a street walker. Might it be possible that Fr. Joe reserves the reading of that passage for Monastic Guests? Let those who have ears, listen: Be forewarned: If you meet with a Mepkin monk to discuss what’s going on in your life, spiritual or otherwise, you will leave the meeting with a book. After a few such conferences, the books started piling up on my desk. The problem was that I never had the time to read them. Throughout my tenure at the abbey, it always felt as though there was somewhere that I was supposed to be, and something that I should be doing there. So, I made the rookie mistake of waving off further book recommendations. Eventually, I recognized my error and came to appreciate that a book recommendation from a Trappist monk is a precious gift, something that the monk believes – or perhaps knows – will help you on the journey. Now authors Cynthia Bourgeault, Michael Casey and Martin Laird are helping to change my life. Providence in disguise: There’s a person in my workplace who once treated me very badly, and whom I had never forgiven. My month at Mepkin seemed like a good opportunity to cross this problem off my spiritual to-do list. So, I asked Fr. Columba whether I could discuss an unspecified “pastoral issue” with him. Fr. Columba readily agreed, but before we got together, he delivered an amazing homily on Matthew 18:21-22 in which his theme was that “forgiveness is a miracle.” Fr. Columba and I still had our talk, but forgiveness was not one of the topics that we discussed. I had already heard what I needed to hear. Where charity and love prevail: There were two fractious incidents between monastic inhabitants during my five-week stay. Of course, I was involved in one of them, stubborn cuss that I am, and I felt incredibly sheepish when the monk on the other side of this contretemps sought me out to apologize within a half-hour. I heard that the other squabble was also resolved in short order. If you want to know how the monks manage to live peaceable in community, there’s your answer. And believe me, I brought this lesson home with me.